Greece and Macedonia have signed a deal that, if ratified, will resolve a decades-old dispute concerning Macedonia’s name. Under the agreement, Greece’s northern neighbour will be renamed North Macedonia, a move the two countries’ leaders said would be the beginning of closer, friendly relations and an example to all Balkan nations. The deal will also allow Macedonia to try to join Nato and the European Union. 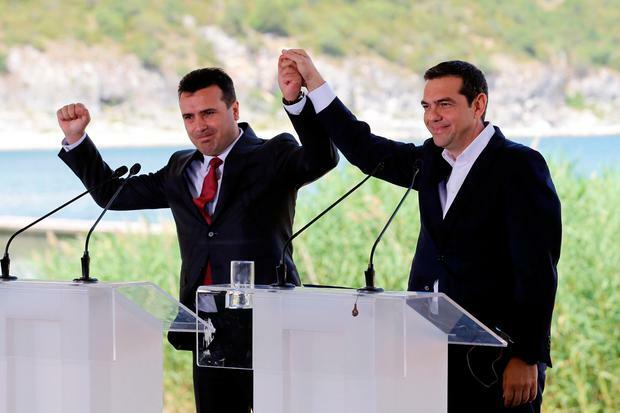 The two countries’ prime ministers, Greece’s Alexis Tsipras and Macedonia’s Zoran Zaev, attended the signing of the deal on Sunday by the two countries’ foreign ministers, Nikos Kotzias and Nikola Dimitrov. Also at the ceremony were UN under-secretary for political affairs Rosemary DiCarlo, the UN mediator for the name dispute, Matthew Nimetz, EU foreign affairs chief Federica Mogherini and EU enlargement commissioner Johannes Hahn. The village of Psarades, on the shores of Greater Prespa Lake, was chosen as a symbolic site, since it is near where the borders of the two countries, as well as Albania, meet. Zaev and Dimitrov arrived by a small speedboat from across the lake and were greeted by Tsipras and Kotzias. “This is our own appointment with history,” Tsipras said, adding that the Balkan people have long suffered from “the poison of chauvinism and the divisions of nationalist hatred”. Recalling his first meeting with Zaev earlier this year at the World Economic Forum in Davos, Switzerland, Tsipras told Zaev that “very few believed we would succeed” in ending what he called “26 years of sterile dispute between our countries”. Zaev, on his part, hailed an “end to decades of uncertainty” and said Greece and Macedonia would henceforth be “partners and allies” setting an example for the whole Balkan region. “We are proud of today’s agreement, may we stay as united forever as we are on this day,” Zaev said. Following the signing, the officials left by boat for the Macedonian lake resort of Oteshevo for a celebratory lunch. 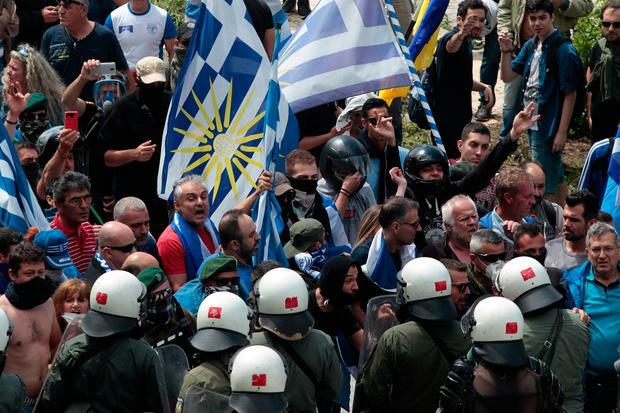 Police had cordoned off all approaches to Psarades to prevent protesters from reaching the site, so more than 4,000 Greek nationalists gathered near Pisoderi, a village 25 miles away. Several hundred marched to a nearby police blockade and began throwing rocks. Police responded with tear gas and stun grenades. Macedonian nationalists who also object to the agreement planned a rally in the city of Bitola, near the Greek border, on Sunday. Since Macedonia seceded from the former Yugoslavia in 1991, Greece had objected to its use of the name Macedonia because it claimed that implied territorial designs on its own northern province of Macedonia. Greek objections delayed UN recognition of Macedonia until April 1993 and then only as The Former Yugoslav Republic of Macedonia (FYROM). In 1995, the two countries signed an interim agreement after Macedonia agreed to modify its flag. Dave Higgens A woman who murdered her step-grandfather on Christmas Day by beating him with his own walking stick and stabbing him more than 120 times has been told she will serve at least 13 years in prison. Independent.ie Newsdesk A 34-year-old Dutchman turned himself in to police hours after driving a delivery van into concert-goers, killing one and critically injuring three others, prosecutors said on Monday.